Kids will have fun learning about the life cycle of a frog with this free printable notebook filled with interesting information, life cycle chart, vocabulary, and a space for recording their observations as they watch tadpoles become frogs in this homeschool science experiment. In our homeschool science this year we did a frog unit. My kids and I are definitely hands on learners so we used a Frog Habitat to watch tadpoles change into frogs. It took a couple months, but it was fascinating to get to experience it ourselves. 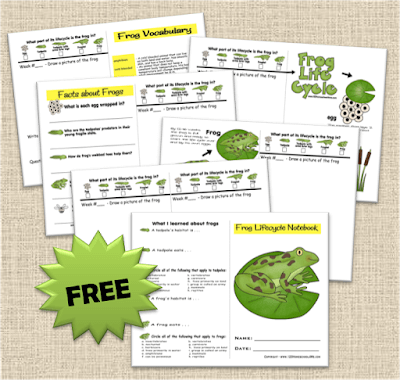 I made this FREE life cycle of a frog printable to help the kids record their observations and to teach them too. We used DK Reader Tale of a Tadpole as our main teaching text. It was simple to read, had beautiful pictures, and was easy enough for my 1st grader to read and my preschool (almost kindergartner) to understand clearly. Virtual Frog dissection app – If you have older kids this virtual frog dissection is awesome. You can see each part and description clearly.